Unofficially nicknamed the “Palm Court” for its undeniable Palm Springs party vibe, the 2017 New American Home by Phil Kean Design Group is like nothing you’ve ever seen before. The 8,200-square foot home features an additional 4,200 square feet of outdoor living space, as well as five bedrooms, eight bathrooms and a four-car garage. Located in the Lake Nona Golf & Country Club, the $5.9 million residence showcases the latest in luxury modern home design trends, building techniques and green-building practices. With a one-of-a-kind figure-8 configuration, the house was built to feature a series of separate areas connected by breezeways. At the push of a button, the home’s glass walls open or close and can even be adjusted to accommodate everything from large crowds to intimate gatherings. The custom modern home is broken down into four zones – the guest bedrooms, the exercise and billiards rooms, the public/common spaces and the master bedroom. At the center of the home, a glass-enclosed great room is surrounded by a covered lanai, providing access to the swimming pool, as well as a bar, temperature-controlled wine room, kitchen and family room. Beyond the family room, an outdoor kitchen and bar lead into a game room and a spa, which includes a home gym and steam room. On the opposite side of the great room, a four-sided glass fireplace separates the master bedroom wing from the rest of the house. On the home’s roof, an outdoor kitchen is flanked by two terraces, each with its own fire pit. Every space in the house is encapsulated in glass pocket doors that effectively blur the lines between indoor rooms and outdoor areas. In fact, it can be easy to forget if you are indoors or outside as you make your way through the home. Located in Central Florida, the home was designed to maximize outdoor living while protecting the interior spaces from overheating. Considering every detail during construction, the air flow across the pool and into the other courtyard actually keeps the temperature 15 degrees cooler inside than outside. With professional golfers as neighbors and world-class greens practically in the backyard, the home would not be complete with a few unique features tying back to the sport. A planned home theater was transformed into a bar complete with a golf simulator perfect for evening practice. 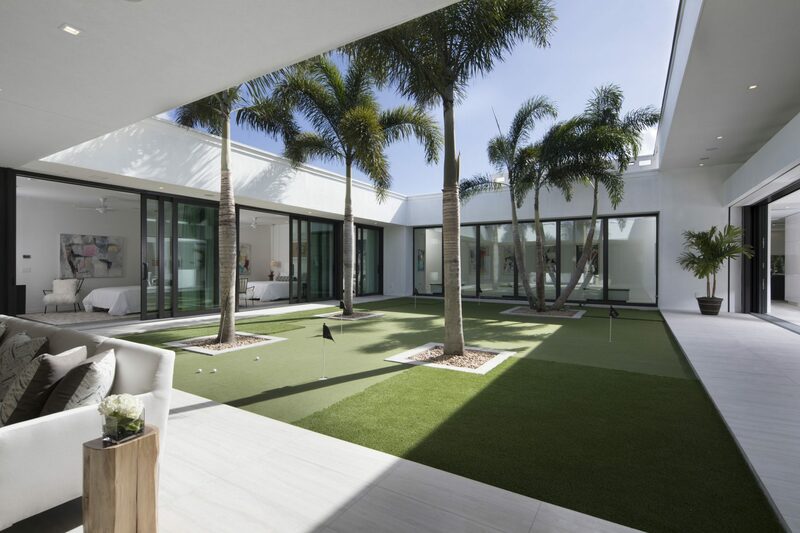 In the central courtyard, you’ll also find a putting green, surrounded by the glass walls of three of the home’s bedrooms. See more of the New American Home and its one-of-a-kind design on our portfolio.